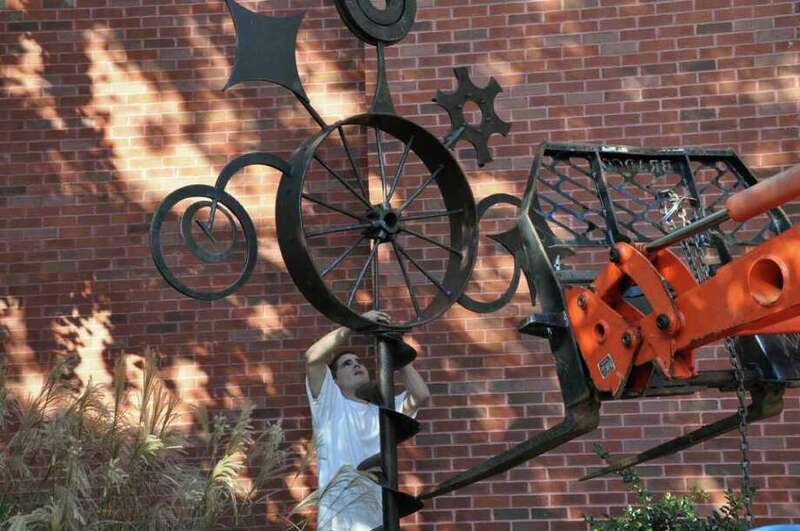 A large scrap-iron sculpture called "Walter" has been installed next to the front entrance of Westport Public Library. The piece, on loan from Weston artist Carole Eisner, is named after a man who helped Eisner gather pieces of iron for her work. It was recently on display in front of New York City's Lincoln Center with eight other Eisner sculptures, part of a "Carole Eisner on Broadway" exhibit. The sculpture was installed by a local arborist and his son using a fork-lift, similar to the way it was stationed in the middle of Broadway for the New York exhibit organized by contemporary art gallery Susan Eley Fine Art and the Broadway Mall Association. For information about Eisner, visit http://www.caroleeisner.com.